fC Plus - Powers Streaming TV Sticks Directly from TV (Any HDMI Media Streaming Player) Adapter Powers from Your Flat Screen TVs USB Port | Eliminate The Need for an AC Outlet. ✅Go Wireless with this fC Plus Adapter Power Cable ( Replaces your Streaming TV Sticks USB power cable ) Powers your TVStick / streaming HDMI device such as Roku, TV Stick, Chrome & or any streaming HDMI device directly from your TVs USB port! Perfect for wall mounted HDTV TV's. ✅ELIMINATES HANGING WIRES from your flat screen TV. Instantly cleans up your messy hanging wire clutter, eliminating the need for AC power outlet. Giving your home theater system / TV wall mount, a clean wireless look. ✅UNIVERSALLY COMPATIBLE. Works with ALL Streaming Sticks... 4K , Voice , Roku & other HDMI Players & Smart Sticks. IMPORTANT: some TVs can not supply sufficient power, however, fC Plus is compatible with more TV's than standard cables and similar products. Built with heavy copper & premium materials made to safely draw maximum power from your TV. ✅SAVES ENERGY & MONEY: Automatically powers your Stick down when you turn your TV off & auto on when you power your TV on, saving on your electricity bill. And completely replaces the need your Sticks USB power cable wall adapter. ✅INSTALLS IN SECONDS & MONEY BACK GUARANTEE Simply connect one end into your TV Stick, the other into your TV... done! PLUS! Money back guarantee, if your not completely satisfied, or find the product not to work with your TV we offer a no questions asked FULL money back guarantee, add to cart & get your fC Plus Now! *ELIMINATES HANGING WIRES FROM YOUR FLAT SCREEN TV. Instantly cleans up your messy hanging wire clutter, eliminating the need for AC power outlet. Giving your home theater system / TV wall mount, a clean wireless look. Powers your TV stick / streaming HDMI device such as Roku, TVStick, Chrome & generic streaming HDMI devices directly from your TVs USB port! Perfect for wall mounted HDTV TV's. Works with ALL Streaming Stick versions & most TV's... Stick Generation 1, Generation 2, 4k with Voice Activated remote, Roku & other HDMI Players & Smart Sticks. 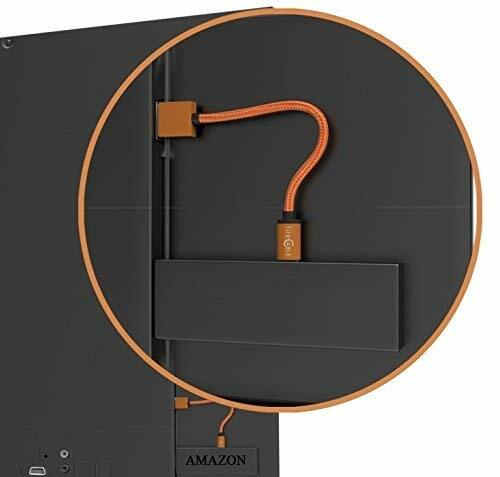 IMPORTANT: In some TVs can not supply sufficient power, however was built exactly for this function and compatible with more TV's than similar products standard micro USB cables. Built with heavy copper & premium materials which safely draw maximum power from your TV to power your streaming device. If your not completely satisfied, or find the product not to work with your TV we offer a no questions asked FULL money back guarantee, add to your cart & get your fireCable Plus Now!